Better Exchange Rate: Credit Card or ATM or Hotel? This is a follow up to my last post (Better Exchange Rate: Credit Card or ATM?). In this post I provide another example comparing Credit Card and ATM exchange rates and add one more exchange rate comparison – a Hotel front desk. The transactions took place in Mauritius where the local currency is the Mauritian Rupee, or MUR. All transactions occurred on September 14th, 2013. I haven’t posted the receipts (which I just found cleaning out my desk the other day) but hopefully I’ve shown enough of my receipts in the past that you know I don’t make up any data. The ATM Transaction from Barclay’s Bank: Using my Charles Schwab Checking account (which reimburses me for all ATM fees), I took out 11,200 MUR from a Barclay’s ATM in Flic-en-Flac. Below is a screenshot from my online banking transactions that shows the converted amount was $363.67 USD. The effective MUR to USD exchange rate was 0.03247. The Credit Card Transaction: As always, I use my Capital One Visa credit card for all transactions in foreign currencies because the card has NO foreign transaction fee, and receives the exact rate that is published on Visa’s corporate exchange rate website. For this purchase, I bought a bunch of groceries from a local supermarket for 2,689.71 MUR. Below is a screen shot from the Capital One transactions webpage which shows I paid $87.34 in USD. The effective MUR to USD exchange rate was 0.03247 (same as the ATM rate above!). Please notice that the exchange rate is for September 16th (posting date) not September 14th. The Hotel Front Desk Currency Exchange: Just for fun, I took a picture of the exchange rate offered by the hotel when I got back from my grocery shopping trip. I didn’t actually change any money, because as you will see it was a horrible rate. The exchange rate from the hotel was .0348 (1/28.771). If I were to get 11,200 MUR like I did for the ATM, it would cost me 389.28 USD instead of 363.67 from the Barclay’s ATM. That is $25.61 extra, or a 7% surcharge! Comparing the Three Methods: It should come as no surprise that exchanging money at a Hotel is a bad deal. However, similar to the previous post comparing ATM and Credit Card Exchange rates, it turns out that getting money from an ATM or paying with your credit card is almost the same when it comes to exchange rates. In the previous post, comparing the ATM to credit card was a little difficult because the credit card transaction was posted a day later than the ATM transaction. In this particular case, making the transactions on a Saturday actually worked in our favor, which means we can compare the rates apples to apples. As explained on Visa’s currency exchange FAQ page, “Every day—except weekends, Memorial Day, Christmas Day and New Year’s Day—Visa calculates the rate for the next day’s transactions.” That means on Friday September 13th, 2013, Visa calculated the exchange rates for Saturday the 14th, Sunday the 15th, and Monday the 16th. I checked on the corporate exchange rate to make sure, and the rate was the same for all three days. So even though the transaction occurred on the 14th and was posted on the 16th, the exchange rate was the same. The fact that the ATM exchange rate is exactly the same (to the 5th decimal point) as the Visa exchange rate makes me think that my Charles Schwab debit card – which is also a Visa – probably uses the Visa corporate webpage rates as well. Better Exchange Rate: Credit Card or ATM? I’ve spent a lot of time researching how Credit Card companies come up with their currency exchange rate (see my post on How Capital One calculates its exchange rate and my post on How Visa calculates its exchange rate). Now that we know how the rates are determined, its time to decide if using the credit card is the best way to pay when traveling as a tourist. In the past few months of travel I’ve experimented with different methods of currency exchange. In today’s post, I’m comparing credit cards with ATMs. Both exchanges took place on January 24th, 2014 at Geneva’s International Airport in Switzerland. 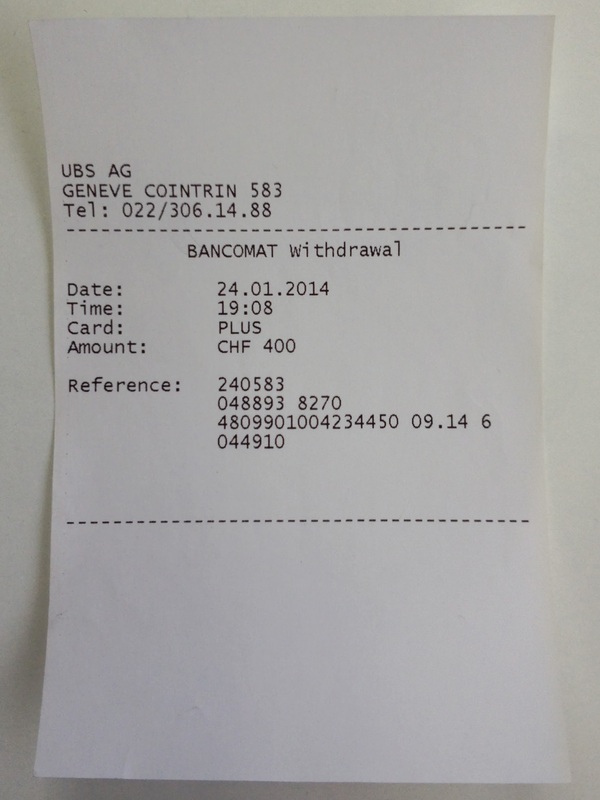 The ATM Transaction from UBS Bank: Using my Charles Schwab Checking account (which reimburses me for all ATM fees), I took out 400 CHF (Swiss Francs) from the UBS ATM in Geneva (receipt below). 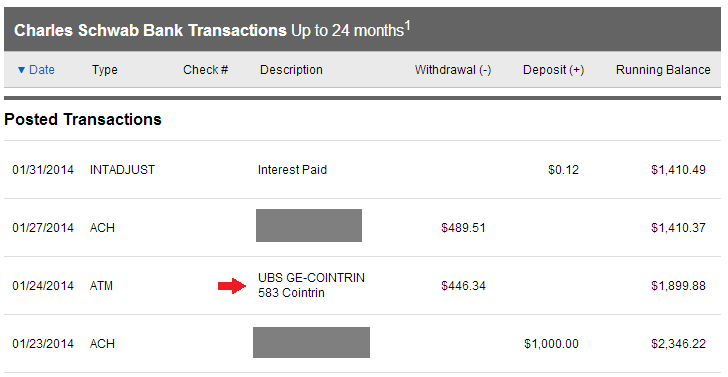 Also below is a screenshot from my online banking transactions that shows the converted amount was $446.34 USD. The effective CHF to USD exchange rate was 1.11585. The Credit Card Currency Exchange: By now it should be clear that I am using a Capital One Visa credit card for all my foreign currency purchases. This particular card has NO foreign transaction fee, and receives the exact rate that is published on Visa’s currency exchange website. For this purchase, I bought a bottle of water for 4.oo CHF (I know, super expensive). The receipt is below as well as a screen shot from the Capital One transactions webpage which shows I paid $4.49 in USD. The effective CHF to USD exchange rate was 1.1225. Comparing the Two Methods: Unfortunately, the credit card transaction posted on January 25th even though it occurred on the 24th. The ATM transaction was posted on the same day it occurred (the 24th), which means we won’t be able to compare the exchange rates apples to apples – but we can come close. This is a an important thing to note – often the exchange rate used by the credit card is the rate from the day after the transaction. This can be either good or bad depending on how the exchange rate changes in a day, but usually won’t result in a huge difference. It is however, something to keep in mind if you are making a big purchase and really in tune with the global currency markets. Below is a chart comparing the exchange rates on Friday January 24th. Because we know my Capital One Credit Card will get its exchange rate from Visa’s corporate exchange rate website, we can easily tell what the exchange rate would have been if the credit card transaction was posted on the 24th instead of the 25th. The ATM rate and Credit Card rates are different by 0.0001, which is basically nothing. I threw in a few other bench marks to see how the exchange rates compare, but the take away here is that the ATM and Credit Card exchange rates are essentially the same. Just for fun, I also made a chart for exchange rates on Saturday January 25th. I don’t know what Schwab’s exchange rate would have been on January 25th, but I included the chart to point out a key point. According to my credit card statement, the exchange rate was 1.225, however, on the Visa corporate website the rate was 1.1234. As you see in the chart, this discrepancy makes no difference when looking at a 4.00 CHF purchase. I explained why there is a difference between the rate you see on the statement and what you see on the corporate webpage in a previous post, I just didn’t want any one to be confused if they looked up the numbers themselves. Final Thoughts: To answer the original question, it looks like using a credit card or ATM will give you the same good rate. Okay, using my credit card would have saved 4 cents, but it is so small maybe that would have been different with another transaction on a different date. One huge caveat though – if you get charged an ATM fee by your bank, then everything changes. Or if you get charged a foreign transaction fee on your credit card – same thing. So make sure you are with a good bank, otherwise worrying about this is useless!